Built on the Award winning success of the Throttle Jockey Pro and the Throttle Jockey RevMax. New features include: New unit now includes both the TJPro and the TJ RevMax. Simply select whether you want to govern or limit while in the calibration mode. Although super servo mode for the TJPro is no longer supported, we still recommend a fast Digital servo to yield the best performance. 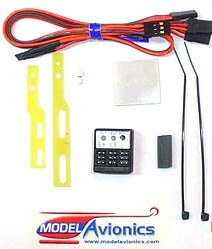 Fully Compatible with all 2.4Ghz systems and conversion modules. Also compatible with the latest high speed receivers. Contains new software for future Model Avionics products. Wondering if you have the new unit? Flip it over and look at the bottom panel. If there are no screws, you have the latest version. Sticker color will vary between blue and silver. If you send it in for an upgrade I will put it in the new style box. Wishing you had the new unit?